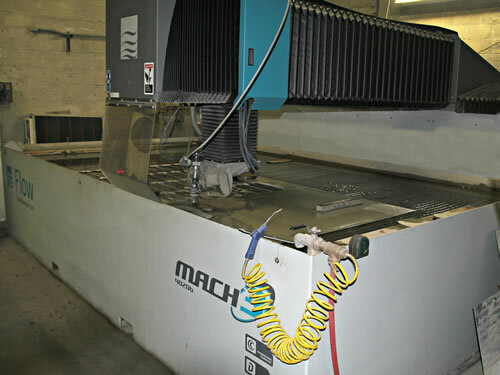 Osage’s Flow Mach 3 Water Jet Cutting System features a full 6′ x 12′ sheet capacity and can accommodate almost any material, from shim stock to 6″ plate, without changing anything on the bed. We can make bed modifications to cut thicker material upon request. You can expect tolerances of +/- .002 on material less than 1″ thick and +/- .005-.010 on material 1″ and above. The jet’s dynamic head compensates for kerf angle and provides a clean, straight, non-invasive edge on cut surfaces that resembles glass beading and eliminates a majority of post-process finishing. The 87K intensifier pump has a huge advantage over other machines by yielding 50% faster pierce times and cut speeds that are twice as fast. 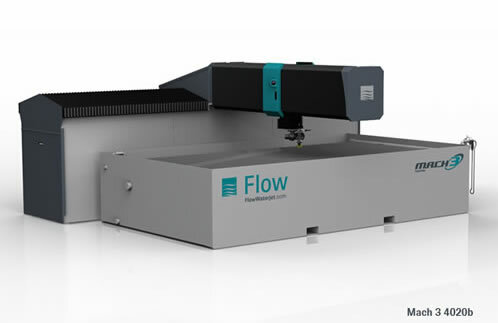 This system is ideal for many different applications: it can cut material that is going to be machined; be used for making gaskets, flow panels, flanges, or decorative signs; produce large quantities of parts that have to be matched; or make just a single, hard-to-find part. We specialize in providing custom one-of-a-kind products. More versatile than other processes — wide range of materials: cuts most materials, including metals, plastics, stone, glass, foam, ceramics. 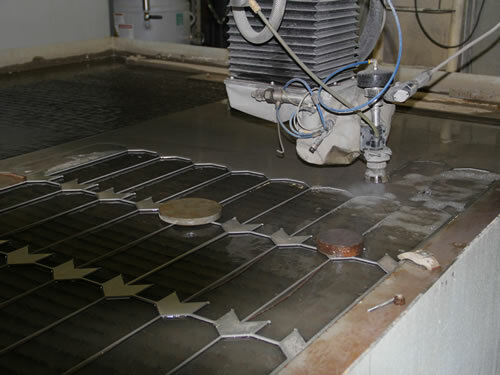 Because there is no heat and no work-induced stress incurred in the cutting process, almost any material is suitable for water jet cutting. Thinnest sheet to more than 6″ thick: allows stacking of materials and cuts a variety of thicknesses, adding productivity to the cutting process. 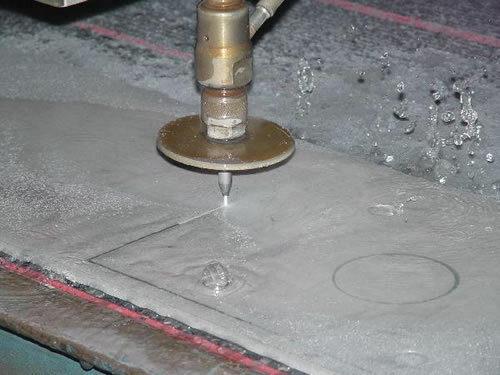 Fits well with other types of material processing: water jet, either abrasive or straight water, can be used as a partner for other processes in fabrication and machining. It even makes an excellent mate for lasers, providing superior quality on aluminum and high finish materials, as well as extending the thickness range on conventional materials such as stainless steel. Environmentally safe and clean: there are no chemicals, gases, or noxious liquids used in the cutting process. Abrasive cutting uses garnet (a high grade sand) as the abrasive, resulting in a very clean process that is preferable to other methods of cutting in terms of environmental impact and resulting disposal of by-products and waste water.